Just before we create the Help menu, we call QMenuBar::addSeparator(). This has no effect for most widget styles (e.g., Windows and OS X styles), but for some styles this makes sure that Help is pushed to the right side of the menu bar. The readSettings() function is called from the constructor to load the user's preferences and other application settings. The QSettings class provides a high-level interface for storing settings permanently on disk. On Windows, it uses the (in)famous Windows registry; on OS X, it uses the native XML-based CFPreferences API; on Unix/X11, it uses text files. We start by opening the file in read-only mode. 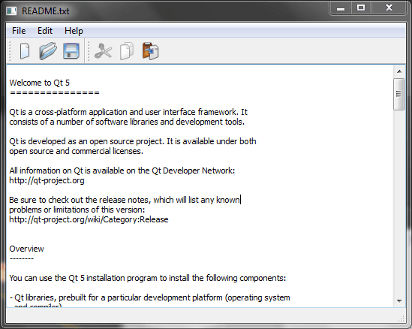 The QFile::Text flag indicates that the file is a text file, not a binary file. On Unix and OS X, this makes no difference, but on Windows, it ensures that the "\r\n" end-of-line sequence is converted to "\n" when reading.